A lot of materials have been tried to make cooking utensils, including iron, copper, brass and even soil. All of these have their own pros and cons. But one material has remained unmatched since its advent and has never gone down in popularity – it’s stainless steel! Why is this material so popular? Here are some reasons. There’s no doubt that stainless steel pots and pans are extremely durable, being a kind of iron. It doesn’t crack, scratch, chip, peel or even rust, despite being a derivative of iron. It may get dents if hit on another hard objects, but it doesn’t break or crack easily as compared to other materials like earthenware or glassware. 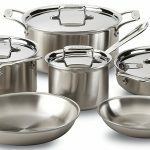 The best stainless steel cookware is so sturdy that it can work for generations after generations. Stainless steel in itself is clean and is also easy to clean. It hardly remains sticky when washed with a simple soap solution and water. You need not rub it hard to remove stains or stickiness. The pot won’t get blue-green stains or any other stubborn stains that you cannot clean easily. Since stainless steel cookware is clean in itself and is also easy to clean, it’s safe to cook or store food in it. The metal doesn’t react with the spices, tartness and other ingredients in the food and so, there is no fear of the food getting toxic. It also won’t catch the yellowness of turmeric or stickiness of oils. Thus it offers perfect safety. As said earlier, stainless steel is very easy to clean. Metals like brass, copper and iron need special cleaning. They also need regular polishing to keep them clean and safe. However, stainless steel never requires polishing. You just need the regular solution of soap and water and it will become sparkling clean. The shining stainless steel pots and pans set in a kitchen make the kitchen look great with their shine. They bring the feeling of cleanliness and pleasure. Because everyone knows their proven durability, everyone feels secure and experiences freedom while handling them and working with them. Stainless steel pots and pans are versatile. You can cook in them and also do many other jobs with them. A rolling board and rolling pin can be of stainless steel. You can store cooked foods and raw grains in stainless steel boxes and containers. You can cook, boil, sauté, shallow fry and deep fry in stainless steel pots and pans. The jars and blades of your food processor, mixer and grinder can be of stainless steel. And you have a guarantee of cleanliness when you are dealing with best stainless steel cookware. Considering all these benefits, turning to stainless steel cookware is your best bet. Start using this sparkling clean metal and enjoy cleanliness and safety while cooking and eating.